1) A two-game win streak for the Vancouver Canucks will have to wait. Up 2-0 early in the third against one of the few teams beneath them in the standings, the Canucks let the New Jersey Devils off the hook on Friday night. The Devils scored twice in the third to tie the game and then won it in the seventh round of a shootout. It was the fifth time this season New Jersey has rallied when trailing after two periods while the Canucks lost for the sixth time when leading after 40 minutes (now 16-2-4). The Canucks still have not won consecutive games since January 18th and 20th and have only strung back to back wins together twice since Christmas. They seemed to be in full control when Tanner Pearson scored a gift goal 1:42 into the third to extend the lead to 2-0, but then sat back and watched as the Devils started to control the play. The Devils tied the game with two of their own and very nearly took the lead in regulation when Travis Zajac was stopped point blank by Jacob Markstrom with 3:40 remaining. 2) The story of the night happened early in the hockey game. Chris Tanev blocked a Kyle Palmieri slap shot on the Devils lone power play of the night. Tanev struggled to the bench and headed straight down the tunnel to the locker room. Later in the period, he returned to the ice during a television timeout, took a quick twirl and once again retreated to the dressing room and that was it for his night. And, as it turns out, his season. After the game, it was revealed that Tanev suffered a broken bone in his foot. He was spotted outside the Canucks locker room in a walking boot and on crutches. The injury occured just minutes into Tanev's fourth period of hockey since missing 11 games with an ankle injury suffered February 13th in Anaheim. Earlier in the season, he missed time with a hip contusion suffered in a late October game in Vegas. Last season, Tanev was shutdown for the year with the final one of his five injuries that forced him out of the line-up. A warrior who puts himself in the line of fire -- perhaps too often at this stage of his career -- Tanev will turn 30 in December and you have to wonder if he has any chance of staying healthy and playing anything resembling a full season ever again. He ended up playing 55 games this season after playing 42 last season and 53 the season before that. As much as he can help the Canucks when healthy, the problem is he just can't stay healthy and can't be counted on to be there for the team because of the long injury history. 3) Elias Pettersson said Friday morning he had to be more selfish with the puck and shoot a little more. He did just that on a second period power play opening the scoring with a snap-shot from the right circle that Devils netminder Mackenzie Blackwood didn't see. It snapped an 11-game goal drought for Pettersson and surely brought with it some relief. The goal was his team-leading 27th of the season and gives him 59 points which ties Trevor Linden's rookie season output and moves Pettersson just a point away from matching Pavel Bure and Ivan Hlinka for the franchise record for first year points. He could reach that mark as soon as Sunday in Dallas. Pettersson also opened the shootout with a spectacular 'Peter Forsberg' drawing Blackwood to his right and then reaching back to deposit the puck into the unguarded goal. It was just another sensational move to add to his already impressive highlight reel that will be shown when he collects the Calder Trophy at the NHL Awards in June. 4) Pettersson was great in the shootout. Unfortunately, his fellow shooters stunk. Pettersson was the only one of seven Vancouver shooters to convert in the skills competition. This has been an on-going issue for the hockey club all season. Pettersson is now 3/6 and is the only Canucks to cash in three times in the shootout. Brock Boeser and Tanner Pearson each hit the post. 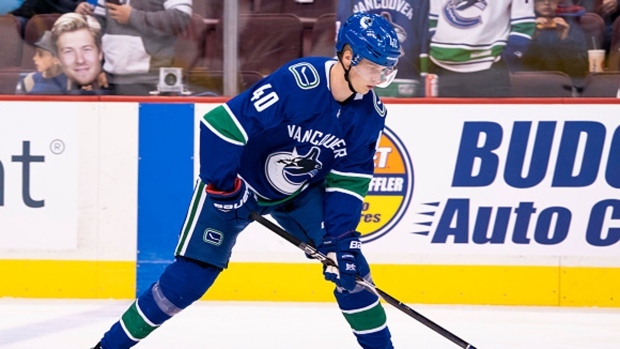 Bo Horvat and Nikolay Goldobin were both thwarted and each of them is now 0 for 5 this season. As a team, the Canucks have won just three of eight shootouts and three of 13 in two seasons under Travis Green. This year, collectively, Canucks shooters are 7 for 34. Pettersson has three of the goals, Boeser and Markus Granlund have the other two apiece. And after that, no other Canuck has managed to score in eight trips to the breakaway contest. 5) With Anaheim scoring five times in Colorado on Friday and the Canucks managing just two goals, the Ducks moved out of the basement and ahead of Vancouver in goals scored since Christmas. Yes, the Vancouver Canucks are now 31st and dead last in the NHL in offense since the brief December holiday break. The Canucks have managed 74 goals in their last 32 games (an average of 2.31 per game). They have scored five times twice in that span (vs FLA on January 13th and in COL on February 2nd) and been shutout six times. Brock Boeser leads the team in goals and points since Christmas (11+14=25) and he and Elias Pettersson (10) are the only players on the roster in double-digits during that time. Boeser, Pettersson and Bo Horvat (7) are the only players with more than six goals since Christmas. For an organization that wants to believe it is progressing, this has to be a troubling statistic.